The UC Berkeley IURD research team spent two weeks in March following up on over a year of data collection and community mobilization in the informal settlement of Mukuru in Nairobi, Kenya. The partnership between IURD project lead Jason Corburn, Professor of Public Health and City and Regional Planning; Shack/Slum Dwellers International (SDI); Muugano Wa Wanavijiji; and Akiba Mashinani Trust has been built on a decade of engagement with residents and advocacy work in informal settlements across Nairobi. An IURD research team including Vincent Agoe, Julieth Ortiz, Regan Patterson, and project coordinator Marisa Asari worked closely with Nairobi partners in 2016 to document and synthesize data on existing conditions in the Mukuru informal settlement, where residents face challenges of poverty, environmental hazards, job insecurity, poor access and quality of basic services, and lack of housing tenure among others. Mukuru is one of the largest of over 150 informal settlements in Nairobi, Kenya with an estimated population of 300,000 people. The Mukuru area includes the settlements of Mukuru Kwa Njenga, Mukuru Kwa Reuben, Viwandani, Mukuru Kayaba, Fuata Nyayo, and Mariguini, which are situated in an industrial zone approximately seven kilometers southeast of Nairobi's central business district. Despite a previous transfer of land titles to private developers in the 1980s, the land in Mukuru remained undeveloped and was quickly settled upon by migrant families and industrial workers drawn to jobs in the neighboring industrial zone and Nairobi's city center. As the settlements began to grow and densify, issues of land tenure and threats of eviction intensified the contestation of land ownership in Mukuru. Land tenure challenges common to informal settlements throughout Nairobi have impacted the growth and development of Mukuru, which is currently excluded from legal land policy, county and national planning initiatives, the provision and management of basic services, and formal governance systems. 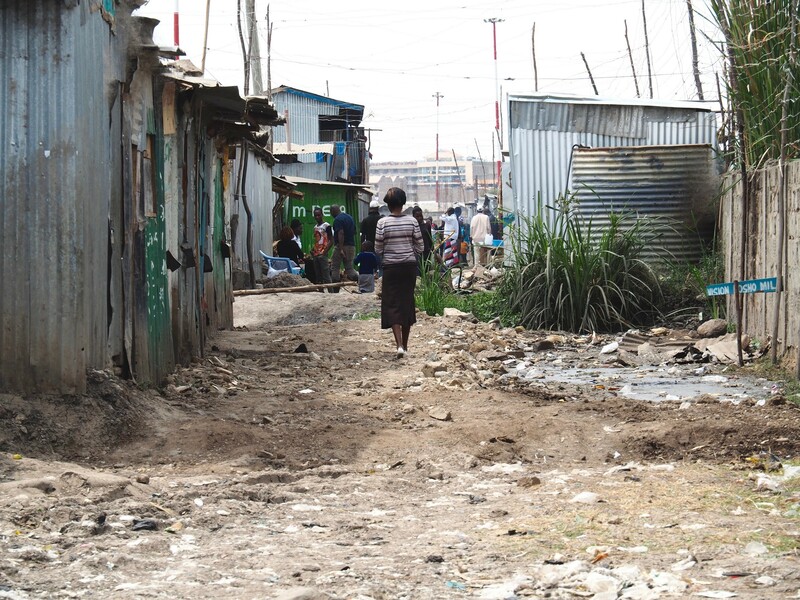 Present-day conditions in Mukuru pose a unique challenge for residents, who are facing pressing issues of rapid densification, lack of basic services, environmental and health risks, along with a lack of integration and growing disconnect with the formalized areas of Nairobi county. While Mukuru faces many challenges, it has strong community initiatives and assets such as women-led savings groups, youth groups, a network of schools and community facilities, and a robust informal labor market that provide opportunities for growth. The ongoing work in Mukuru has engaged these community stakeholders and utilized settlement profiling, a community-led action research process, to gather and compile information in the following sectoral areas: access to land (eviction); access to services (water and sanitation, electricity, health, education, and nutrition); livelihood opportunities; and demand for housing, infrastructure, and planning. 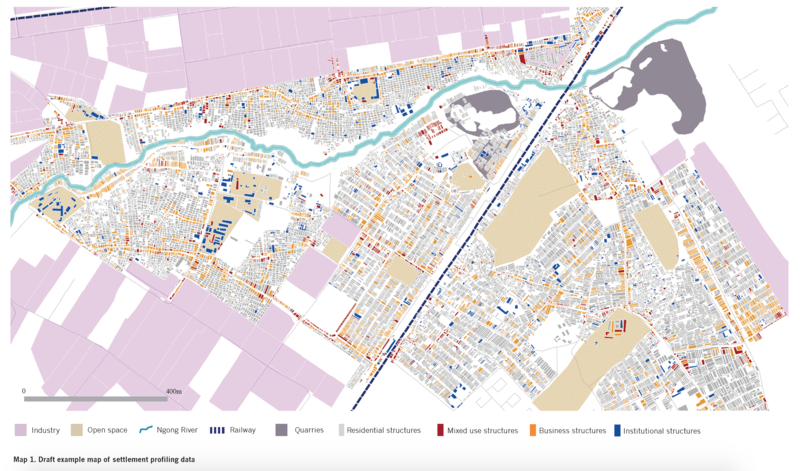 Data collected at the structure level across the approximate 100,000 households in Mukuru is spatially linked, and further analysis has allowed the research team to visualize each of the data sets in a series of maps that give a comprehensive profile of the settlement. Urban poor communities have historically collected data and produced knowledge about their settlements as well as everyday lives. However, synthesizing this information and presenting to decision-makers has proved challenging. Standardizing the data and community knowledge through settlement profiling and reporting helps settlement residents established partnerships with governments and allows them to collaborate with city agencies focused on land, housing, infrastructure, and other urban issues. Muungano, SDI, AMT, and Mukuru community members have recently negotiated with Nairobi City County to declare the settlements of Mukuru Kwa Njenga, Mukuru Kwa Reuben, and Viwandani a Special Planning Area, using the rich data- and community-led analysis of existing conditions to advocate for the allocation of City County resources for planning and improving the area. The special planning designation will allow city planners and community members to develop plans that address both immediate and long-term challenges. Over the next two years, the research and community engagement will focus on mobilizing settlement residents and partnering with local government to develop sustainable and equitable solutions. The current research consortium is comprised of NGO and university partners including SDI Kenya, Muungano Wa Wanavijiji, Akiba Mashinani Trust, Katiba Institute, Strathmore University, University of Nairobi, and UC Berkeley, with funding provided by IDRC Canada.